The large octagonal step-cut spinel, weighing 50.13 carats, within decorative old brilliant and rose-cut diamond claws, framed by larger old brilliant-cut diamonds, mounted in silver and gold, mounted as a brooch/pendant with detachable fittings, formerly the centrepiece of a larger jewel, diamonds approximately 6.50 carats, detachable brooch fitting, dimensions of brooch 4.0 x 3.2cm, cased by Mallet, The Octagon Bath & 40, New Bond Street, London, a note pinned to the interior reads “Spinnel Ruby from Hope Collection”. During what is believed to be the most anticipated jewellery sale of the year, Bonhams London will present the Hope Spinel: a spectacular jewel of great provenance, and with a romantic and tumultuous life. once part of one of the world’s greatest gem collections until its owner – London banker Henry Philip Hope – died in 1839. This fantastic jewel will be auctioned at Bonhams London next September 24, and the estimate is US$240,000-310,000. Henry Philip Hope (1774-1839) was from a famous dynasty of wealthy merchants and merchant-bankers. The Hopes were also prominent collectors and patrons of the arts. The family firm gave them a huge income with which to amass extensive and extremely valuable personal collections of pictures, porcelain, antiquities, sculpture, books, bronzes and jewels. By 1800, in fact, London was not just an important global commercial centre, it was also the pivot of the European art world where rich connoisseurs, both native and foreign, competed against each other for the finest objects. The eldest Hope brother, Thomas, became a noted scholar, collector, writer, proponent of Neo-Classicism and an enlightened patron. For him the arts “were the object of his existence”. Thomas filled his London house, in Duchess Street, Mayfair and his country mansion The Deepdene, Surrey, with treasures which he opened to the public. After marriage to the beautiful Louisa Beresford (died 1851), the couple entertained royalty and fashionable society as well as leading artistic and literary figures on a lavish scale. The couple had three sons, Henry Thomas (1808-1862), Adrian John (1811-1863) and Alexander Beresford-Hope (1820-1887) who inherited the valuable art collections of both their father and of their uncle, Henry Philip. Henry Philip was extremely close to his eldest brother Thomas and his family. The two would often purchase, share and exchange works of art with each other. Henry Philip’s prime passion was for collecting gems and it is for his priceless collection of precious stones that he is best remembered. Henry Philip greatly admired his sister-in-law, Louisa, and lavished as many jewels on her as her husband; he also allowed her to wear some of the most important gems in his collection at society balls. Henry Philip was a great connoisseur of gems and jewellery and his collection is believed to have been formed from around 1800 until his death. Louisa Beresford-Hope, his sister-in-law to whom he was devoted, once recalled how his collection gave him the greatest pleasure and how he would examine it every day. The Hope Diamond, the prize of the collection, a 45.52 carat fancy deep blue diamond, believed to have been purchased by French gem merchant Jean-Baptiste Tavernier in India and sold to King Louis XIV of France in the late 1660s. When Hope acquired it, it was one of only a handful of blue diamonds known to exist. Today, it is one of the most famous diamonds in the world and is on display at the National Museum of Natural History, Washington DC. The Hope Pearl, a huge baroque natural pearl, then the largest known, which was two inches in length and four and a half inches in circumference (now in a private collection). The Hope Pearl and the Hope Diamond.  The largest known cat’s eye chrysoberyl, with a diameter of over an inch and a half, that had once been in the crown jewels of the last King of Kandy (Sri Lanka). The Hope Spinel in its original case. Until 1783, red and pink spinels were mistaken for rubies because they are chemically similar. 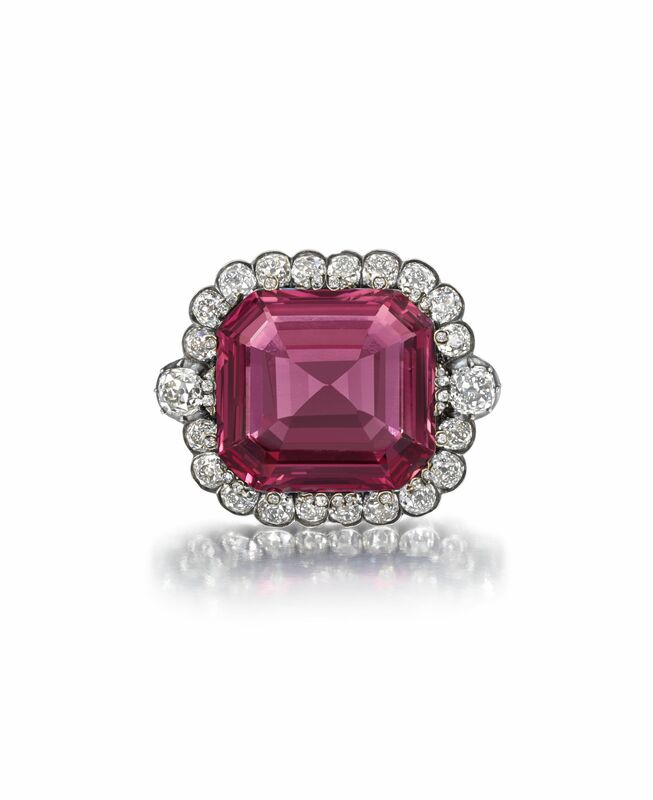 Even after fine pink gems were known to be spinels they were still referred to as “balas” or “balais” rubies. The term “balas” derives from an ancient word for Badakhshan, a province north of Afghanistan on the border with Tajikistan, where important spinel specimens were anciently mined. These Kuh-i-Lal (‘red mountain’) mines were the world’s main source of large spinels from the 1st century AD. Marco Polo (c. 1254-1324) described how “fine and valuable balas rubies” were dug only for the King, who owned the entire supply, which he sent to other kings as tributes or as “friendly presents”. Mughal emperors and their ancestors, the Timurids, valued large Kuh-i-Lal spinels for their beauty and as protective talismans. Rough spinel from Kuh-i-Lal. Photo © Vincent Pardieu/fieldgemology.org. The gems were polished rather than cut and were often inscribed with the names of rulers and monarchs as a way of commemoration. The Carew Spinel, in the collection of the V&A in London, is inscribed with the names of Emperors Jahangir, Shah Jahan and Aurangzeb. The Carew Spinel, Victoria & Albert Museum. Bequeathed by the Rt. Hon. Julia Mary, Lady Carew. Spectacular Mughal spinels which entered Persian, Russian and European royal treasuries include the “Black Prince’s Ruby”: a large uncut red spinel, it was given to the Black Prince by Pedro the Cruel in 1367, worn by Henry V in his helmet at the Battle of Agincourt and is now set in the Imperial State Crown in the British crown jewels. The 361-carat “Timur Ruby”, also in the British crown jewels, was owned by Sultan Sahib Qiran and Ranjit Singh, the “Lion of the Punjab”. A huge polished spinel decorates the Imperial Crown of Russia, made for the coronation of Catherine the Great in 1762. Catherine The Great’s Imperial Crown. In the 19th century, important spinels were cut according to European ideals. The Hope Spinel’s polished octagonal shape exploits to best advantage its fine pink colour and transparency. The SSEF laboratory in Switzerland has graded it as “exceptional” due to its size, colour, purity and well-proportioned cut. Other large spinels of similar cut mounted in 19th century jewellery may be seen in the “ruby” jewels of Queen Therese in the Munich Treasury. These jewels were mounted in 1830 using a mixture of rubies and spinels from the collection of Elector Max III Joseph. Queen Therese Ruby Tiara, c. 1830 – rubies, spinels, diamonds. The “Bagration” jewels, now in the collection of the Duke of Westminster, are Russian-made 19th century diamond and spinel jewels formerly owned by Catherine Bagration, a Russian princess. The spinel was stated to weigh 199.5 grains (approximately 50 carats). In 2015, having been weighed using precise modern technology, the spinel is confirmed as 50.133 carats. How Hope came to acquire this spinel is not known; the provenance of most of his collection is unclear – and this is the fascinating and mysterious side of the story. Hope died childless at the end of 1839. In his will, after abundant, very generous legacies to relatives, friends, servants, former servants, relatives of servants and servants of relatives and friends, he asked that his immense fortune be divided equally between his three nephews, the sons of his elder brother Thomas. His epithet as “the angel of the family” of “an excellent heart and amiable disposition” was well deserved. In a letter delivered to his nephews after his death there was no mention of his famous gem collection, then valued in the region of £80,000 (nearly £8 million in today’s money). Instead, in order to avoid the payment of death duty on it, he had gifted it by a separate deed kept secret from the beneficiary until his death. Unfortunately, due to failing memory, Henry Philip left several secret deeds of gift regarding his gem collection and both his eldest nephew, Henry Thomas Hope and his youngest nephew, Alexander Beresford-Hope, believed they were the rightful heir. This escalated into a decade of very bitter and very public legal wrangling between Henry Philip’s nephews. Finally, it was settled that Alexander should inherit the majority of the gems, but Henry Thomas was to keep eight of the most valuable jewels, including the Hope Diamond. Thus by 1849, Henry Philip’s collection, which had been his pride and joy, and which he wished above all else to remain intact, began to be dispersed. London jeweller Hunt and Roskell managed to acquire some of the gems, as did the Victorian collector Reverend Chauncey Hare Townshend (died 1868) who left his collection of Hope’s gems to the South Kensington Museum in London (now the V&A). Alexander Beresford-Hope’s portion was sold by Christies in 1886. The renowned gemmologist George F. Kunz, who worked for Tiffany & Co, described the sale as a “regrettable dispersion” and that in his opinion such a collection should have been “preserved intact as a national possession”; the Times of London reported “very spirited competition among the great dealers in precious stones”. The gems belonging to Henry Thomas Hope stayed within the family until the 20th century. After his death in 1862, his widow Anne Adele inherited his estate including the eight gems and other items of Hope jewellery. Their only child, a daughter called Henrietta, married Henry Pelham-Clinton, Earl of Lincoln (later Duke of Newcastle). In order to preserve the Hope legacy, including the jewels and especially the Hope Diamond, she left it in its entirety to her second grandson, Henry Francis Pelham-Clinton, for his lifetime, on condition he assume the Hope surname and coat of arms. Francis Hope received his colossal inheritance in 1887 but soon squandered it; like his father he lived beyond his means and was an inveterate gambler. In 1896 he was declared bankrupt and in order to ease his debts, he began petitioning the courts to break the entails on his grandmother’s legacy in order to sell off the art collections. In 1898 he sold some valuable pictures and in 1901 he sold the Hope Diamond, which eventually ended up in America where it is to this day. In 1917 the remaining treasures were irrevocably dispersed at Christies in the auction of “The Hope Heirlooms” ranging over several days. On July 17, the Hope Spinel, then mounted as the centrepiece of a bracelet, was sold for £1,060 (£80,000 in today’s money) to the London dealer Drayson. Thereafter, the spinel turned up in the jewel collection of Lady Mount Stephen, nee Georgiana (Gian) Tufnell (1864-1933), 2nd wife of George Stephen, 1st Baron Mount Stephen (1829-1921). Lord Mount Stephen, of Scottish ancestry, was a Canadian millionaire and philanthropist, president of the Bank of Montreal, president and builder of the Canadian Pacific Railway and the first Canadian to be made a British peer. They married in 1897 and lived in the UK at Brockett Hall in Hertfordshire and at Carlton Terrace in London. Gian had been lady-in-waiting to the Duchess of Teck, Queen Mary’s mother, and was a close friend and confidant of Queen Mary. In fact she was a great favourite with many members of the royal family and the Mount Stephens regularly entertained Queen Mary and George V at Brockett Hall. Lady Mount Stephen gave Queen Mary a spectacular diamond necklace, which was later given to Princess Margaret, who wore it on her wedding day. When Lady Mount Stephen died in 1933, the spinel passed to Lord Mount Stephen’s niece Elsie Reford (1872-1967). Elsie, as both the niece of Lord Mount Stephen and the daughter of Robert Meighen, a wealthy Montreal businessman, was a noted society figure. Her clothes were made in Paris and New York and she and her husband Robert Reford were passionate collectors of fine art and jewels and amassed one of the largest art collections in Canada. When Elsie’s daughter-in-law, Evelyn Reford (1899-1994), was presented at Court in London, in the 1920s, she wore the Hope Spinel as a pendant. The spinel was then inherited by Elsie’s grand-daughter and Lady Mount Stephen’s god-daughter. The present owner is a direct descendant of the Reford family and says the spinel has always been known as the “Hope Spinel that belonged to Aunt Gian”. Today the spinel is still mounted “en medaillon” with diamonds and is mounted as a brooch. Post edited by Claudia Carletti, Jewellery Through Time. All material courtesy of Bonham’s.